For other uses, see Caldera (disambiguation). A caldera is a large cauldron-like hollow that forms following the evacuation of a magma chamber/reservoir. When large volumes of magma are erupted over a short time, structural support for the crust above the magma chamber is lost. The ground surface then collapses downward into the partially emptied magma chamber, leaving a massive depression at the surface (from one to dozens of kilometers in diameter). Although sometimes described as a crater, the feature is actually a type of sinkhole, as it is formed through subsidence and collapse rather than an explosion or impact. Only seven known caldera-forming collapses have occurred since the start of the 20th century, most recently at Bárðarbunga volcano in Iceland. The word comes from Spanish caldera, and Latin caldaria, meaning "cooking pot". In some texts the English term cauldron is also used. The term caldera was introduced into the geological vocabulary by the German geologist Leopold von Buch when he published his memoirs of his 1815 visit to the Canary Islands,[note 1] where he first saw the Las Cañadas caldera on Tenerife, with Montaña Teide dominating the landscape, and then the Caldera de Taburiente on La Palma. Animation of analogue experiment showing origin of volcanic caldera in box filled with flour. A collapse is triggered by the emptying of the magma chamber beneath the volcano, sometimes as the result of a large explosive volcanic eruption (see Tambora in 1815), but also during effusive eruptions on the flanks of a volcano (see Piton de la Fournaise in 2007) or in a connected fissure system (see Bárðarbunga in 2014–2015). If enough magma is ejected, the emptied chamber is unable to support the weight of the volcanic edifice above it. A roughly circular fracture, the "ring fault", develops around the edge of the chamber. Ring fractures serve as feeders for fault intrusions which are also known as ring dikes. Secondary volcanic vents may form above the ring fracture. As the magma chamber empties, the center of the volcano within the ring fracture begins to collapse. The collapse may occur as the result of a single cataclysmic eruption, or it may occur in stages as the result of a series of eruptions. The total area that collapses may be hundreds or thousands of square kilometers. Some calderas are known to host rich ore deposits. One of the world's best-preserved mineralized calderas is the Sturgeon Lake Caldera in northwestern Ontario, Canada, which formed during the Neoarchean era about 2,700 million years ago. If the magma is rich in silica, the caldera is often filled in with ignimbrite, tuff, rhyolite, and other igneous rocks. Silica-rich magma has a high viscosity, and therefore does not flow easily like basalt. As a result, gases tend to become trapped at high pressure within the magma. When the magma approaches the surface of the Earth, the rapid off-loading of overlying material causes the trapped gases to decompress rapidly, thus triggering explosive destruction of the magma and spreading volcanic ash over wide areas. Further lava flows may be erupted. If volcanic activity continues, the center of the caldera may be uplifted in the form of a resurgent dome such as is seen at Cerro Galán, Lake Toba, Yellowstone, etc., by subsequent intrusion of magma. A silicic or rhyolitic caldera may erupt hundreds or even thousands of cubic kilometers of material in a single event. Even small caldera-forming eruptions, such as Krakatoa in 1883 or Mount Pinatubo in 1991, may result in significant local destruction and a noticeable drop in temperature around the world. Large calderas may have even greater effects. When Yellowstone Caldera last erupted some 650,000 years ago, it released about 1,000 km3 of material (as measured in dense rock equivalent (DRE)), covering a substantial part of North America in up to two metres of debris. By comparison, when Mount St. Helens erupted in 1980, it released ~1.2 km3 (DRE) of ejecta. 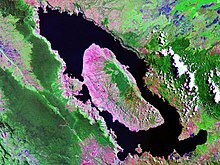 The ecological effects of the eruption of a large caldera can be seen in the record of the Lake Toba eruption in Indonesia. About 74,000 years ago, this Indonesian volcano released about 2,800 cubic kilometres (670 cu mi) dense-rock equivalent of ejecta. This was the largest known eruption during the ongoing Quaternary period (the last 2.6 million years) and the largest known explosive eruption during the last 25 million years. In the late 1990s, anthropologist Stanley Ambrose proposed that a volcanic winter induced by this eruption reduced the human population to about 2,000–20,000 individuals, resulting in a population bottleneck. More recently, Lynn Jorde and Henry Harpending proposed that the human species was reduced to approximately 5,000-10,000 people. There is no direct evidence, however, that either theory is correct, and there is no evidence for any other animal decline or extinction, even in environmentally sensitive species. There is evidence that human habitation continued in India after the eruption. Eruptions forming even larger calderas are known, especially La Garita Caldera in the San Juan Mountains of Colorado, where the 5,000 cubic kilometres (1,200 cu mi) Fish Canyon Tuff was blasted out in eruptions about 27.8 million years ago. At some points in geological time, rhyolitic calderas have appeared in distinct clusters. The remnants of such clusters may be found in places such as the San Juan Mountains of Colorado (formed during the Oligocene, Miocene, and Pliocene epochs) or the Saint Francois Mountain Range of Missouri (erupted during the Proterozoic eon). Some volcanoes, such as the large shield volcanoes Kīlauea and Mauna Loa on the island of Hawaii, form calderas in a different fashion. The magma feeding these volcanoes is basalt, which is silica poor. As a result, the magma is much less viscous than the magma of a rhyolitic volcano, and the magma chamber is drained by large lava flows rather than by explosive events. The resulting calderas are also known as subsidence calderas and can form more gradually than explosive calderas. For instance, the caldera atop Fernandina Island collapsed in 1968 when parts of the caldera floor dropped 350 metres (1,150 ft). Since the early 1960s, it has been known that volcanism has occurred on other planets and moons in the Solar System. Through the use of manned and unmanned spacecraft, volcanism has been discovered on Venus, Mars, the Moon, and Io, a satellite of Jupiter. None of these worlds have plate tectonics, which contributes approximately 60% of the Earth's volcanic activity (the other 40% is attributed to hotspot volcanism). Caldera structure is similar on all of these planetary bodies, though the size varies considerably. The average caldera diameter on Venus is 68 km (42 mi). The average caldera diameter on Io is close to 40 km (25 mi), and the mode is 6 km (3.7 mi); Tvashtar Paterae is likely the largest caldera with a diameter of 290 km (180 mi). The average caldera diameter on Mars is 48 km (30 mi), smaller than Venus. Calderas on Earth are the smallest of all planetary bodies and vary from 1.6–80 km (1–50 mi) as a maximum. The Moon has an outer shell of low-density crystalline rock that is a few hundred kilometers thick, which formed due to a rapid creation. The craters of the moon have been well preserved through time and were once thought to have been the result of extreme volcanic activity, but actually were formed by meteorites, nearly all of which took place in the first few hundred million years after the Moon formed. Around 500 million years afterward, the Moon's mantle was able to be extensively melted due to the decay of radioactive elements. Massive basaltic eruptions took place generally at the base of large impact craters. Also, eruptions may have taken place due to a magma reservoir at the base of the crust. This forms a dome, possibly the same morphology of a shield volcano where calderas universally are known to form. Although caldera-like structures are rare on the Moon, they are not completely absent. The Compton-Belkovich Volcanic Complex on the far side of the Moon is thought to be a caldera, possibly an ash-flow caldera. The volcanic activity of Mars is concentrated in two major provinces: Tharsis and Elysium. Each province contains a series of giant shield volcanoes that are similar to what we see on Earth and likely are the result of mantle hot spots. The surfaces are dominated by lava flows, and all have one or more collapse calderas. Mars has the largest volcano in the Solar System, Olympus Mons, which is more than three times the height of Mount Everest, with a diameter of 520 km (323 miles). The summit of the mountain has six nested calderas. Because there is no plate tectonics on Venus, heat is mainly lost by conduction through the lithosphere. This causes enormous lava flows, accounting for 80% of Venus' surface area. Many of the mountains are large shield volcanoes that range in size from 150–400 km (95–250 mi) in diameter and 2–4 km (1.2–2.5 mi) high. More than 80 of these large shield volcanoes have summit calderas averaging 60 km (37 mi) across. Io, unusually, is heated by solid flexing due to the tidal influence of Jupiter and Io's orbital resonance with neighboring large moons Europa and Ganymede, which keeps its orbit slightly eccentric. Unlike any of the planets mentioned, Io is continuously volcanically active. For example, the NASA Voyager 1 and Voyager 2 spacecraft detected nine erupting volcanoes while passing Io in 1979. Io has many calderas with diameters tens of kilometers across. 3D CGI aerial spinning view over Santorini, Greece. Aerial view of the Laacher See, Germany. ^ Gudmundsson, M.T. et al. (2014) Graduale caldera collapse at Bárðarbunga volcano Iceland, regulated by lateral magma outflow, Science, 15. ^ "UMD: Precambrian Research Center". University of Minnesota, Duluth. Retrieved 20 March 2014. ^ Ron Morton. "Caldera Volcanoes". University of Minnesota, Duluth. Retrieved 3 July 2015. ^ "Stanley Ambrose page". University of Illinois at Urbana-Champaign. Retrieved 20 March 2014. ^ Gathorne-Hardy, F. J.; Harcourt-Smith, W. E. H. (2003). "The super-eruption of Toba, did it cause a human bottleneck?". Journal of Human Evolution. 45 (3): 227–30. doi:10.1016/S0047-2484(03)00105-2. PMID 14580592. ^ Petraglia, M.; Korisettar, R.; Boivin, N.; Clarkson, C.; Ditchfield, P.; Jones, S.; Koshy, J.; Lahr, M. M.; Oppenheimer, C.; Pyle, D.; Roberts, R.; Schwenninger, J. L.; Arnold, L.; White, K. (2007). "Middle Paleolithic Assemblages from the Indian Subcontinent Before and After the Toba Super-Eruption". Science. 317 (5834): 114–16. Bibcode:2007Sci...317..114P. doi:10.1126/science.1141564. PMID 17615356. ^ "What's the Biggest Volcanic Eruption Ever?". livescience.com. 10 November 2010. Retrieved 1 February 2014. ^ Best, MG (2013). "The 36–18 Ma Indian Peak–Caliente ignimbrite field and calderas, southeastern Great Basin, USA: Multicyclic super-eruptions". Geosphere. 9 (4): 864–950. Bibcode:2013Geosp...9..864B. doi:10.1130/GES00902.1. ^ "EO". Earthobservatory.nasa.gov. 23 December 2013. Retrieved 20 March 2014. ^ a b c d e Parfitt, L.; Wilson, L. (19 February 2008). "Volcanism on Other Planets". Fundamentals of Physical Volcanology. Malden, MA: Blackwell Publishing. pp. 190–212. ISBN 978-0-632-05443-5. OCLC 173243845. ^ Gudmundsson, A. (2008) Magma chamber geometry, fluid transport, local stresses and rock behaviour during collapse caldera formation in Gottsmann, J. and Marti, J. (editors) (2008) Caldera Volcanism: Analysis, Modelling and Response, Amsterdam, Elsevier. p. 319, citing Lipman, P. (2000). ^ Chauhan, M.; Bhattacharya, S.; Saran, S.; Chauhan, P.; Dagar, A. (2015). "Compton–Belkovich Volcanic Complex (CBVC): An ash flow caldera on the Moon". Icarus. 253: 115–29. Bibcode:2015Icar..253..115C. doi:10.1016/j.icarus.2015.02.024. Clough, C. T.; Maufe, H. B.; Bailey, E. B. (1909). "The Cauldron-Subsidence of Glen Coe, and the Associated Igneous Phenomena". Quarterly Journal of the Geological Society. 65 (1–4): 611–78. doi:10.1144/GSL.JGS.1909.065.01-04.35. Kokelaar, B. P; and Moore, I. D; 2006. Glencoe caldera volcano, Scotland. ISBN 9780852725252. Pub. British Geological Survey, Keyworth, Nottinghamshire. There is an associated 1:25000 solid geology map. 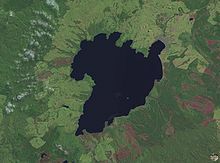 Wikimedia Commons has media related to Caldera. Look up caldera in Wiktionary, the free dictionary.